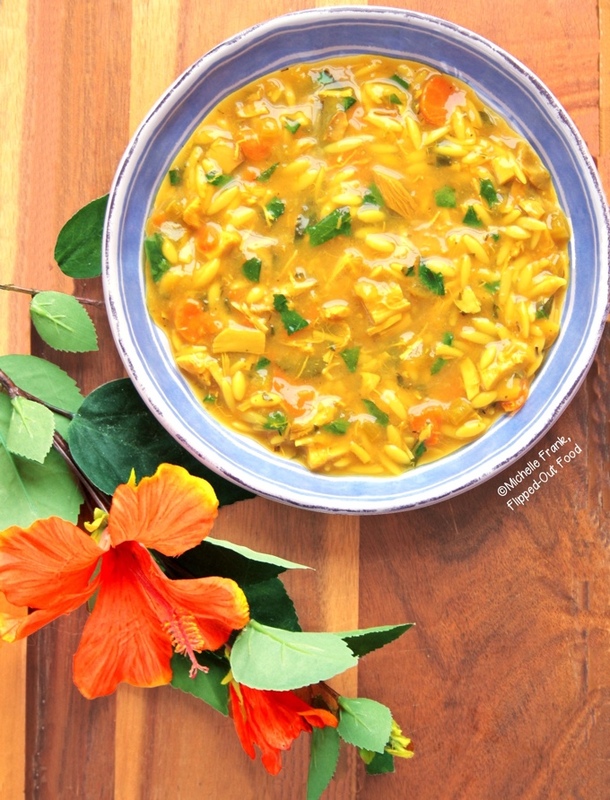 Lemon-Turmeric Chicken Orzo Soup is full of nutrients and flavor. Easy to make in the stovetop or Instant Pot. This winter has been brutal. As a result, we have consumed our own weight—many times over—in soup. After all, there’s nothing like a steaming bowl of soup to make you feel better about life. Especially if that soup is also packed with wholesome ingredients and superfoods! For the most flavorful soup, start out with rich, homemade stock made with the carcass of a roast/rotisserie chicken, aromatics, and herbs (#1 in the figure below). I suggest doing this part on the weekend because it has to be cooked, then strained and degreased. 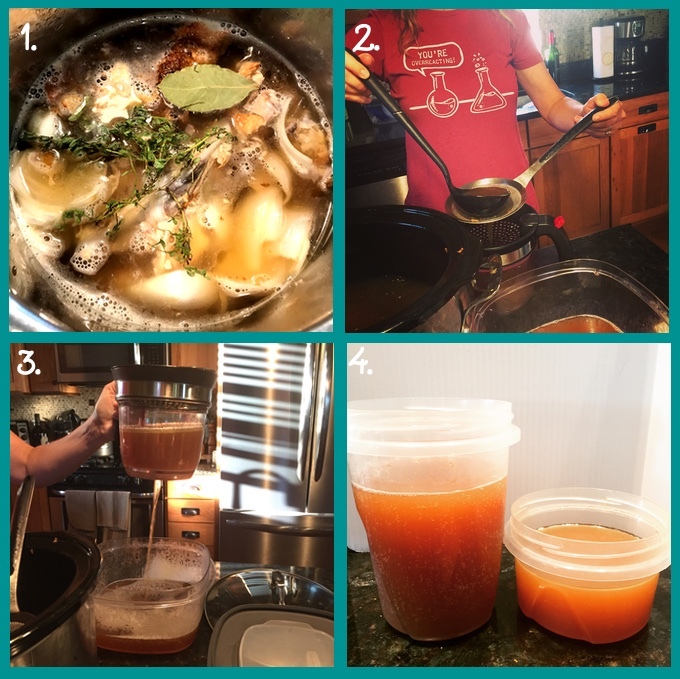 The instant pot is perfect for this task: 60 minutes at high pressure (plus up to 20 minutes on either end to allow the pot to pressurize and then naturally release after the cook time) results in a delicious stock that you can use later. On the other hand, you can cook the stock in the slow-cooker (low and slow, up to 24 hours [I’ve even done 36]). After the stock has cooked, I fish the solids out with a skimmer and discard. Then, I ladle the broth through a fine-mesh strainer into a fat separator (see image #2 below). Finally, I decant/pour the broth from the fat separator into storage containers (in #3 below, you can see the light-colored fat on top of the stock). If I’m planning to freeze the stock (it keeps for up to 6 months), I leave an inch at the top to allow the stock to expand in the freezer (see #4 below). Better yet, I often have already-made chicken stock (for example, Simple Pressure-Cooker Chicken Stock) hanging out in the freezer. You can, of course, use your favorite store-bought, high-quality chicken stock instead. First, obviously, is the turmeric. I add a half tablespoon for the entire pot because turmeric can be quite strong. It’s also a superfood: turmeric, which contains curcumin, which is believed to have anti-inflammatory properties and antioxidative effects. I love to use a mix of dried herbs that contains savory and thyme. So, herbs de Provence is a good choice. Just before serving, I garnish with some chopped fresh parsley. I’m a raving, rah-rah fan of rotisserie chickens from the grocery. They’re VERY economical (often far cheaper than buying a chicken and roasting it yourself). I use every part of the rotisserie chicken, right down to the carcass (as explained above) and the gelatin in the bottom of the container. That gelatin is absolute GOLD for stock: it’s not fat (for the most part). It’s mostly rendered collagen, which is also packed with nutritive value AND dramatically enhances the flavor of any stock. Orzo is one of my favorite pasta shapes for soup (ditalini and acini de pepe are also up there). The pasta cooks right in the broth, so it soaks up some of the delicious flavor. If you have leftover soup, you’ll likely have to add additional liquid, since the pasta will continue soaking up the broth after you store it. Around a cup of water should do the trick (you’ll probably also have to add an additional pinch of salt). Meal-prep is such a time saver. You can cube the cooked chicken, slice and dice the veggies, and chop the fresh herbs. If you’re planning to make the soup that day, you can also zest the lemon (I wouldn’t advise storing the zest for more than a day, though). 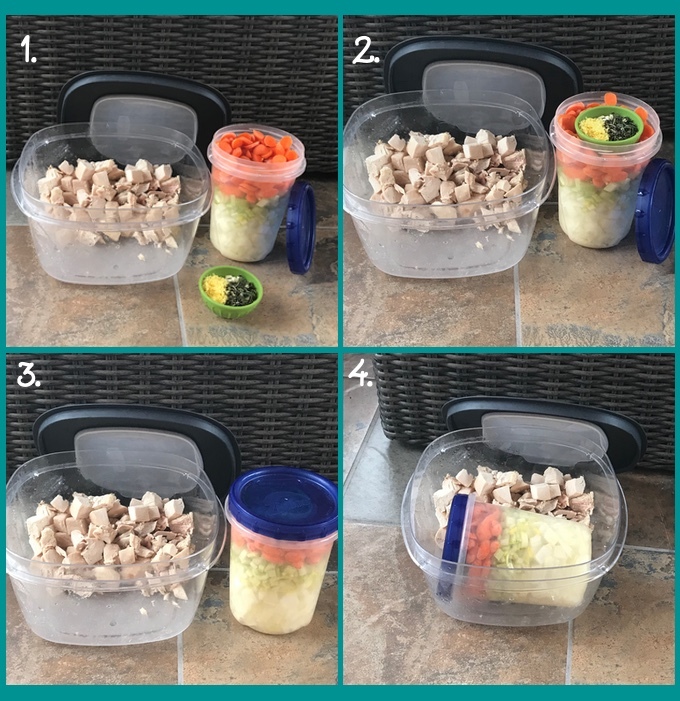 I like to store everything together to make a “meal kit.” First, I put the cubed chicken in one half of a large, plastic container. I sliced and diced my mirepoix (celery, onion, and carrot). Since it all goes in the pot at the same time, I stored it in the same container. I put the lemon zest, minced garlic, and chopped rosemary in a small ramekin. Then, I hollowed out a space for the ramekin in the container with the mirepoix so it would sit snugly against the lid. After lidding the container with the mirepoix and ramekin, I set it into the larger container with the chicken. One note about this meal prep process: if you don’t plan to make the lemon-turmeric chicken orzo soup within the next day, don’t zest the lemon yet. Lemon zest loses its flavor fairly quickly. One weekend afternoon, I made this entire soup from start to finish—including the stock—in my Instant Pot. My reasoning for doing this was not dirtying another pot. I highly recommend this approach when you don’t want to heat up your kitchen by using the stovetop. The broth took about an hour and 40 minutes (60 minutes at high pressure, plus 20 minutes on either end for the pot to pressurize and naturally depressurize). After straining and degreasing the stock, I simply rinsed out the insert of the Instant Pot and started working on the soup. I used the saute function to soften the veggies, deglaze, and simmer. It worked beautifully! The orzo cooked right in the soup: it takes 9–12 minutes, depending on the package instructions. When the orzo was almost done, I added in my greens and simmered until just softened and then stirred in the lemon juice. Perfection! Once you’ve made the stock, the stovetop method is very similar to the Instant Pot method. For this reason, you’ll see photos from both methods in the collage below. 1. Saute the onions, celery, and carrots in a heavy-bottomed pot over medium-high heat (or the insert of an Instant Pot set on Saute [press the “saute” button multiple times to select “more” for high] until translucent and softening. Add the rosemary, dried herbs, and garlic. Saute for an additional minute. 2. Add in the turmeric and saute for one more minute. 3. Deglaze the pot by adding some white wine and using a wooden spoon to scrape up any bits on the bottom of the pot. 4. Add in the broth and the orzo. Bring to a simmer. 5. Add the chicken. 6. Return to a simmer. Continue simmering until the orzo is done to your liking. 7. While the soup simmers, chop the baby kale (or other greens), removing any large stems. 8. Add the kale to the simmering soup. Simmer until just softened. 9. Add the lemon juice. 10. Serve topped with a sprinkling of chopped parsley. This recipe begins with cooked chicken (the abovementioned [fabulous, budget-friendly] rotisserie chicken). If you prefer to start with raw, the recipe changes a bit. You’ll first want to saute the chicken (cut it into small cubes) with the vegetables. Then, if you’re making the soup in the instant pot, I’d suggest using the pressure cooker function. After deglazing with wine and adding in the zest, herbs, stock, and orzo, press “cancel” (to turn off the saute function). Then, close the lid of the Instant Pot and seal the valve. Set the instant pot on “pressure cook” mode at high pressure for 6 minutes. Then, carefully do a quick pressure release (protect your hands!). NOTE: this cooking time is based on my orzo, which has a 9-minute cooking time. If your orzo has a different cooking time, you may need to adjust. Also, check to be sure that the chicken is cooked through and not pink anywhere. Simmering for a few additional minutes should take care of any undercooked pieces (see below). Press cancel and then “saute”. Let the soup simmer, adding in your greens, until the orzo is cooked to your liking and the greens are just softened. Ladle the soup into bowls and top with a sprinkling of chopped fresh parsley. 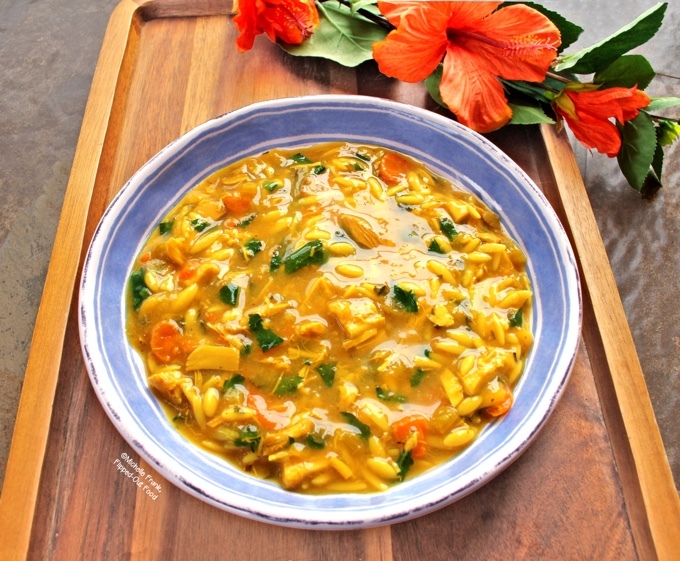 If you make the stock for the Lemon-Turmeric Chicken Orzo Soup a day or two in advance (or if you have stock on hand), you can make the soup in a matter of 30 minutes. It’s a bright, delicious recipe that I hope you’ll love! 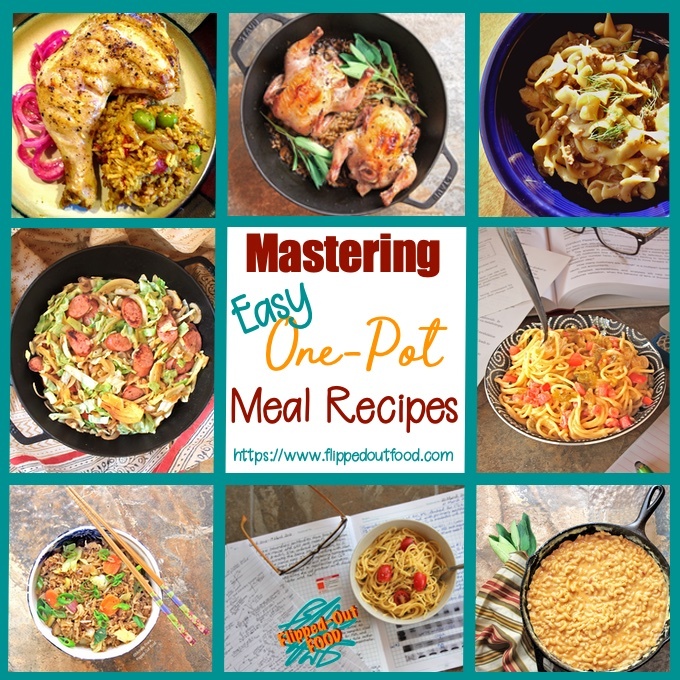 #CookBlogShare, a great food blogger recipe-share hosted this week at Recipes Made Easy. Delicious Dishes Recipe Party (coming soon! ), a weekly link party where bloggers share their most delicious recipes and check out other bloggers’ amazing recipes, hosted by Walking on Sunshine. 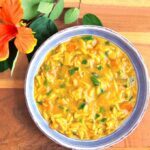 Lemon-Turmeric Chicken Orzo Soup is a bright, delicious soup that's full of nutrients and superfoods. You can make it on the stovetop or in your Instant Pot. (If using premade or store-bought stock, skip to "FOR THE SOUP.") Add the chicken carcass to the insert of a slow-cooker or Instant Pot with onion, garlic cloves, bay leaf, rosemary, peppercorns. Add very hot water, 2 cups at a time, to the container in which the chicken was packaged to rinse any drippings. Add the water and drippings to the cooker. Repeat four times, for a total of 8 cups. Add one additional cup of water. Cook at least 8 hours (and up to 24) in the slow-cooker on low. FOR THE INSTANT POT: close the lid and seal the valve. Press the "Pressure Cook" button enough times so that "More" is selected. Press the plus sign until the cooker's display shows 60 minutes. After a brief pause, The Instant Pot will now pressurize for around 20 minutes before the clock begins to count down. When the cook time is complete, allow the pressure cooker to depressurize naturally (don't release the valve; this can take another 20 or so minutes). Use a skimmer to remove the large solids from the stock; discard. Ladle the stock through a fine-mesh strainer into a fat separator. Pour the degreased stock from the fat separator into a storage container (the fat can be seen in a lighter layer on top of the stock; or see Recipe Note #4). The finished stock in storage containers. If you plan to freeze the broth, leave about an inch of space between the top of the stock and the lid (the stock will expand when it freezes). You can freeze the stock up to 6 months. Note: you should get about 8 cups of stock: if you come up short, you can make up the difference with store-bought stock or water. Warm the olive oil over medium-high heat in a heavy-bottomed pot (or the insert of an Instant Pot set on Saute). Saute the onions, celery, and carrots until translucent and softening. Add the rosemary, dried herbs, and garlic. Saute for an additional minute Add in the turmeric and saute for one minute. Deglaze the pot by adding some white wine and using a wooden spoon to scrape up any bits on the bottom of the pot. Add in the stock, lemon zest, and the orzo. Bring to a simmer. Add the chicken. Continue simmering until the orzo is done to your liking (9–12 minutes, depending on the package directions). While the soup simmers, chop the baby kale (or other greens), removing any large stems. Add the kale to the simmering soup; simmer until just softened. Mix in the lemon juice. Serve topped with a sprinkling of chopped parsley. Roasted chicken (or turkey) carcasses are amazing for making stock. If you don't have one on hand, you can also use your previously made, frozen stock OR favorite high-quality store-bought stock. If you have the container for the chicken, rinse it several times with hot water and add to the slow-cooker or Instant Pot (this will make sure that any solidified collagen in the container is added to the stock). Mustard greens, spinach, or any kind of kale would also be delicious. Just be aware that spinach takes far less cooking time than kale. Alternatively, cool the stock by placing the insert of the slow-cooker or Instant-Pot in a sink filled part-way with cold water for 20 minutes. Transfer to storage containers and refrigerate. When the stock is chilled, any fat will congeal at the top of the container. Simply scrape off the fat layer: your stock is now virtually fat-free and can be used immediately or frozen. If you are starting with raw chicken, cut it into small cubes and saute with the vegetables. Then, if you're making the soup in the instant pot, use the pressure cooker function. After deglazing with wine and adding in the zest, herbs, stock, and orzo, press "cancel" (to turn off the saute function). Then, close the lid of the Instant Pot and seal the valve. Set the instant pot on "pressure cook" mode at high pressure for 6 minutes. Then, carefully do a quick pressure release (protect your hands!). Press cancel and then "saute". Let the soup simmer, adding in your greens, until the orzo is cooked to your liking and the greens are just softened. Ladle the soup into bowls and top with a sprinkling of chopped fresh parsley. Follow me on Twitter, Pinterest, Facebook, and Instagram. PLUS, get easy dinner ideas and cooking hacks delivered straight to your inbox when you subscribe to the Flipped-Out Food Newsletter! Wow, this is a happy soup! I made the whole thing (from stock onward) in one evening and then refrigerated it. That is the first time I’ve ever had a soup jelly-fy owing to the richness of the stock. The flavors get better the longer this soup sits. It’s healthy, vibrant, and delicious! Thanks for a wonderful taste of spring. This is definitely on my “make again” list. SWEET! I’m so happy to hear that the soup turned out so well for you! The “jellified” soup is the reason that I’m not hesitant to add a cup or 2 of water if needed: it’s very rich. But as you saw, the stock itself is almost entirely fat free after that degreasing step. I totally agree that the soup gets even better after it has a chance to sit in the refrigerator. 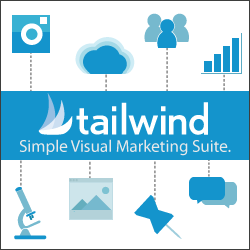 Thanks for your testimonial: it shows that the “work ahead” method is totally worth it! This feels so comforting with lemon, turmeric and lots of veggies. Thank you so much Balvinder!! What a delicious sounding soup and that gorgeous colour from turmeric makes it even more desirable! I love chicken soup which is by far the most comforting soup ever. Your take on it is super tasty (love the sound of lemon here too)! I’ve got some frozen chicken stock and some chicken meat leftover from Sunday roast so will have to give it a go! Thank you so much, Jo!! Yay, I’m glad I’ve helped you figure out what to do with those leftovers. I hope you love it!! Gosh that looks the perfect soup for winter days but I can actually eat soup anytime of the year so pinning to make later. This looks like an absolute taste sensation! I love the chicken and lemon combo. This is just perfect for the winter weather. I’m not going to be able to stop thinking about this for the next week!